Garden Force offers the most comprehensive landscape gardening services in Northampton and cover a wide variety of garden work which will help achieve outstanding results. Our portfolio of work ranges from small scale turf laying to complete garden overhauls which includes the design of any landscaping work and large scale work such as decking, block paving, patios and retaining walls. We also offer contracted maintenance work which will keep your garden looking consistently exceptional. We have always satisfied the gardening needs of both our commercial and domestic customers, improving their gardens to gain both brilliant aesthetic and functional results to their delight. Our team of Northampton landscape gardening specialists have years of experience in the industry and can boast a range of different skills which they can use to produce outstanding results for you and your garden area. Designed and landscaped my back garden. Discussed my initial ideas and provided new cost effective ideas where appropriate. Arrived at the agreed times and kept me fully informed of progress. Completed works on time. Replaced our drive. Was the cheapest quote of 4 (half the price of the costliest), and went into great detail about exactly what was going to be done, which convinced us, because we were able to compare with other good jobs. Work was executed exactly as quoted, and finished a day before the promised date, despite changes being asked for part way through, and some unexpected problems cropping up. Final quality was everything we hoped for, and better than we actually expected! Work was monitored by two people we trusted (we have an ex-builder and surveyor in the family) and they said it was all done professionally and properly. I have no hesitation in recommending this company to anyone needing paving, and I’d expect similar quality in any other work they undertook. 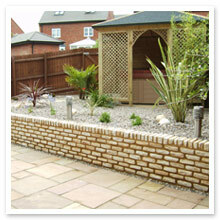 Re-landscaped established garden according to our design but with a few practical modifications. The bulk of the work consisted of replacing and extending paving slabs together with installing timber edging. The replacement of anti-weed membranes, stoning, the removal of unwanted shrubs and excess earth were also included. Excellent workmanship, very friendly, job finished three days. For business inquiries feel free to call, email or use the contact form to the right. We can’t wait to hear from you soon!